Toronto, ON — One of Toronto’s trendiest shopping destinations, West Queen West (WQW) between Bathurst and Gladstone, is set to launch Toronto’s first Neighbourhood e-Gift Card program on November 1st. 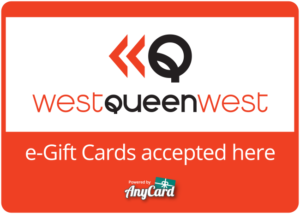 The WQW e-Gift Card provides shoppers with a more local alternative rather than a mall gift card or big box chains. How it works: shoppers can purchase an e-gift card from the WQW website and send it by email, text, or Facebook Message. The gift card is redeemable at a variety of local WQW restaurants, cafes, spas, salons, retailers, and specialty shops. Some of the places you can use The WQW e-Gift Card include Downward Dog Yoga Centre, Gladstone Hotel, Jacob and Sebastian, Mini Mioche, Morba, Smoque N’ Bones and many other local favorites. A full list of participating businesses can be found on the WQW website and can also be spotted with a WQW e-Gift Card sticker in their window. Here is a preview of the first 60 WQW e-Gift Card participating businesses with many more to come.